Solo Pianist, Michael Martinez, plays a 9 foot Yamaha concert grand piano on the turnout after the Bixby Bridge. 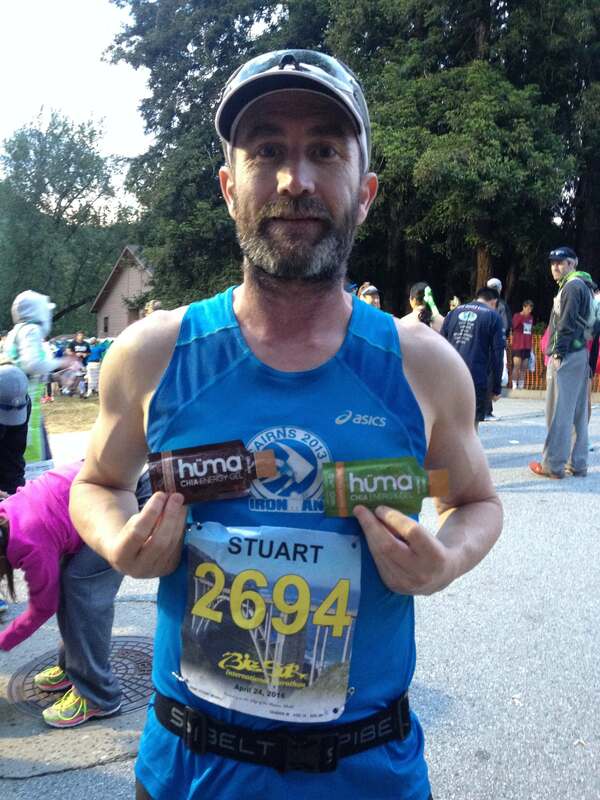 He has played for the marathon since 2005 aiming to play from the first runner to the last. The shuttles leave early in the morning. Factor this in for your race preparation. Many people will hire a car to drive along the coast. Those who don’t will want to stay close in the historical downtown area or the tourist precinct near Cannery Row to be close to packet pick-up, race expo and additional activities. We found some great plant-based food options at Hula’s Island Grill and El Cantaro Vegan. Many of the restaurants in the historical downtown area had good vegetarian options on the menu also. NorCal will be warmer and more humid than most other places. Hydration will be important, especially for those travelling from cooler climates. The race caters very well to slower runners. There are lots of entertainers and frequent aid stations in the second half of the course. The median time for the race is slower than most marathons (closer to 5 hours as compared to 4:30). With that said, there is a firm 6 hour cut-off time enforced so that the highway can be re-opened, so be sure you can cover the distance, including undulating hills and photo stops, within the time limit. The event has a range of distance options, though you will need to be in either the Marathon or the 21 Mile to be able to run across the iconic Bixby Bridge. All events finish at the same point. The finish area was busy, but well staffed with volunteers and the shuttles back to town ran smoothly. One of the aid stations towards the finish was handing out super tasty fresh strawberries, and there is generally a lot of entertainment on course to keep you motivated. The Bixby Bridge is often featured in race photos. The drums at Little Sur Bridge give you a great boost for the climb ahead. Stopping to take photos is encouraged. The race guidelines request that runners step off to the shoulder and avoid disrupting other runners when taking photos. I indulged my photo-taking habit to capture highlights. The famous mile markers, which are sponsored by local businesses, added humor and encouragement. Our race day was overcast, which impacted our photo quality, but gave a welcome respite from the sun. Our race day also included course record winds according to one of the “grizzled veterans” who had completed every Big Sur Marathon. Running the biggest climb of the day (520 ft gain over 2 miles) into the headwind made for an additional challenge. The race is well organized and provides an excellent destination race experience. The packet pickup and expo were well managed and the shuttles to the starting line leave early in the morning, giving runners plenty of time at the start to prepare. The pre-start area had plenty of amenities. Running along the “Ragged Edge of the Western World” (California’s Pacific Coast) provides amazing scenery. 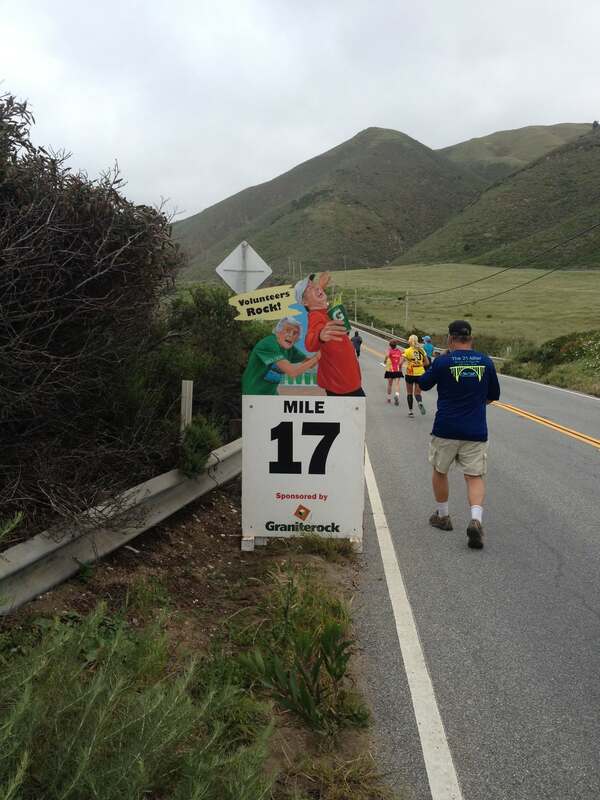 The Big Sur Marathon is regularly featured in lists of the World’s Most Scenic Races and is a bucket list run for many people.